Farmer-to-the-stars Lee Hudson invites former Chez Panisse chef David Tanis to his Napa Valley home to create a California-style Thanksgiving dinner, using ingredients grown on Hudson’s 2,000-acre ranch. David Tanis and Lee Hudson’s Thanksgiving dinner.Photo © Fredrika Stjärne. When an invitation to Thanksgiving dinner arrives from Lee Hudson, longtime grape-grower and winemaker in Napa’s Carneros region, I accept. Even though, every year, I go to my brother Tony’s house for the holiday, I accept—not only because Lee is an extraordinary host, but because he is the genius loci of his land. His Hudson Ranch and Vineyards, some 50 minutes northeast of San Francisco, sits on an expanse of oak woodland, with the San Pablo Bay glimmering beyond. Dinner will be served outside, on a terrace overlooking all of this. Undoubtedly, some awfully good wine will be poured, and the meal will be unforgettable, because David Tanis—cookbook author, columnist for the New York Times and chef emeritus at Chez Panisse—is preparing it, using ingredients grown mainly on the ranch itself. Also, I know Lee well enough to predict that his cast of characters will not be dull. So I put aside my guilt about my brother and say yes to Lee. I rumble through the ranch and up the world’s longest driveway to the villa, perched on top. It’s surrounded by lush English and Italian gardens. I pass monstrous pumpkins—the size of Mini Coopers—anchoring the vegetable garden. Last year, Lee’s landscaper Leonardo Ureña won a prestigious contest in nearby Half Moon Bay for a record-breaking pumpkin of 1,704 pounds, and the ones growing now aren’t far off. Other enormous vegetables come into view, like a shady trellis of dangling, elongated green gourds, some so hefty they hang supported in hammocks. When I arrive at the house, the first person I spot is Lee, whom I know because his wife, Cristina Salas-Porras, has been a great friend of mine for years. Lee is standing in his wine cellar, amid prosciutti and sausages hanging from the rafters, dressed ruggedly in a cowboy hat, a pressed white shirt and jeans. Most of the wines tonight, he says, will be from his own vineyards, but he’s also choosing wines from Kongsgaard, Kistler, Ramey and Arietta—other Napa stars for whom Lee has long grown grapes. He went to graduate school with many of these guys at the University of California at Davis in the 1970s, and they’re old friends. A cheese course highlights the locavore theme. Photo © Fredrika Stjärne. David Tanis, Lee Hudson and Cristina Salas-Porras prep for the meal. Photo © Fredrika Stjärne. 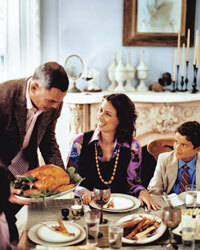 Salas-Porras goes over last details for Thanksgiving dinner. Photo © Fredrika Stjärne. The property he chose in Carneros has cool bay breezes and stony volcanic soil, ideal for Chardonnay and Pinot Noir. At a time when most vineyards focused on maximum quantity, Lee was clear: He wanted to grow for quality. And so he worked with a number of winemakers in the area to grow grapes according to their specifications, on plots they’d chosen on his ranch. He also started to diversify. Now, olive trees provide a soft border around the vineyards. Along with 700 trees in orchards, they produce enough for small quantities of Italian-style olive oil. (The name on the label, Titi’s Carneros Olive Oil, belonged to his flamboyant, jet-setting mother, Titi.) Lee and his crew also tend a vegetable garden that supplies his family and those who work on the ranch. By 2007, he had a larger, two-acre garden and a livestock program with poultry, eggs and Berkshire pigs. Part of the enterprise turned into a CSA, and now that produce also goes to top Bay Area restaurants like Chez Panisse, Bix, A16, Quince, Angel and Ad Hoc. Today the kitchen, filled with vegetables and fruit still warm from harvest, provides a welcome back to California for former Chez Panisse chef David Tanis, who now lives in New York and Paris. 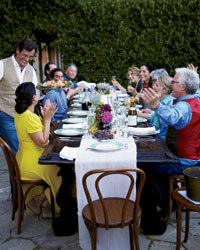 He was invited to cook Thanksgiving by Cristina, who befriended him as Alice Waters’s assistant. 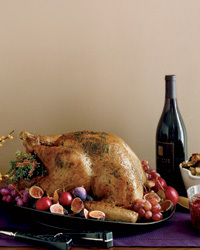 The only things on his menu that don’t come from the gardens are two plump, local BN Ranch turkeys. “In keeping with Lee and Cristina’s lifestyle, we’ve come up with a meal that is not ultra-traditional,” says David. “With a nod to Cristina’s heritage, we have a Mexican twist to the crudité platter.” It’s an arrangement of carrots, cucumbers and radishes sprinkled with salt, lime and chile. “And as guests arrive, to satisfy the first hungry urge, we’ll serve smoked salmon on little toasts.” They taste great with the 2009 Hudson Vineyards Chardonnay—full-bodied but not oaky. The turkeys come out of the oven now, and go into a wood-fired pizza oven outside to crisp to a gorgeous brown. David makes a salad of white beans and barely steamed haricots verts in a vinaigrette. And he can’t resist another giant vegetable pulled from the gardens—cannonball-size beets, which he juliennes and keeps raw, seasoned with salt, cumin and citrus. Both salads go on the table, family-style, along with a spicy, ruby-red tomato-and-ginger chutney instead of cranberry sauce. Twenty or so of the couple’s friends find seats as the last few dishes are laid down among glowing candles and tiny flowers. Into the glasses go Lee’s 2009 Syrah and 2006 Favia Rompecabezas, a Southern Rhône–style blend from winemaker Andy Erickson and viticulturist Annie Favia, his wife, who is here. Dinner lasts until well after dusk. At the end, out comes a platter of autumn fruits, Cowgirl Creamery cheeses and breads from Della Fattoria, followed by a cranberry custard tart, glistening with cranberries candied in a sugary syrup. And there’s a big, puffy, fragrant apple pie, too, made with ranch apples—“for those gluttons who are still hungry,” David jokes. I wonder, what would my brother Tony have to say about them apples? If he were here, he’d understand. Peggy Knickerbocker is a writer and cookbook author based in San Francisco. She is currently working on a memoir called It Can Happen to You: Love Later in Life. Lee Hudson chooses wines to pair with David Tanis’s menu. Photo © Fredrika Stjärne. In addition to making his own wines, Lee Hudson sells grapes to several top California wineries. Here, five Hudson Vineyards bottlings. Star winemaker David Ramey has been making his vibrant, citrusy Hudson Vineyards Chardonnay for more than a decade. This Chardonnay, though substantial, stays light on its feet—largely thanks to the cool breezes that roll into Hudson Vineyards off San Pablo Bay. 2010 Failla Hudson Vineyards Chardonnay ($39) Failla’s Ehren Jordan started using Hudson’s fruit years ago, when he was making wine for Neyers Vineyard. He’s never stopped, no doubt because it allows him to make layered, complex Chardonnays like this one. In the cool 2010 vintage, Hudson’s most affordable red has distinctive white pepper and red berry notes. Ray Coursen of Elyse modeled this silky Grenache-based red after wines from Châteauneuf-du-Pape.